Click here to enjoy TagYerit's song Adam & Eve, while you view our "trees"
Click any of the following thumbnails to see the full picture. Meanwhile ... in the year 2000 an estimated 36 million trees were sold in the US. 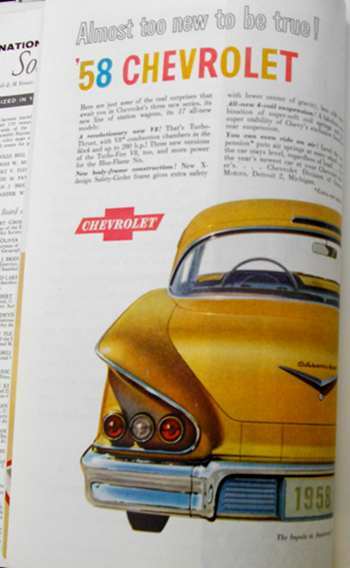 A record amount of 37.2 were sold in 1995. We'd love to see you create an art tree and save the forest. If you're wondering which states supply the most trees, they are Oregon, North Carolina, Pennsylvania and Michigan. 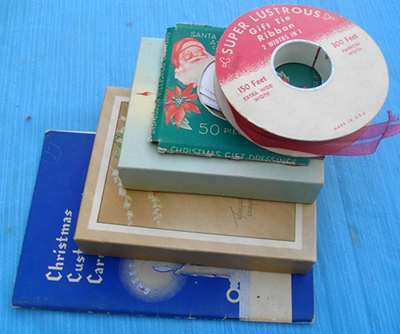 Prior to finding this spool, I had never heard of wire recorders. 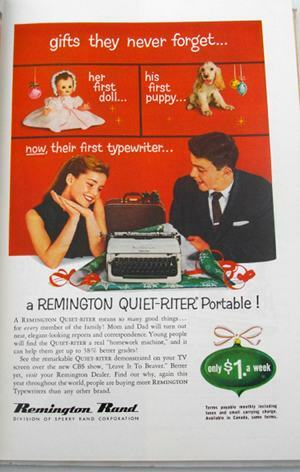 Apparently they were developing at the same time as tape recorders. Danish Inventor Valdemar Poulsen at the start of the 20th century patented the "Telegraphone," a steel wire recorder for use as probably the first telephone recording machine. Until the early 1950s, its future seemed promising, but in 1954, tape recorders sales jumped, and the wire recorders soon became obsolete. Richard Lang & Judith Selby Lang collect trashed & washed-up beach plastic. AND THEN they create art. 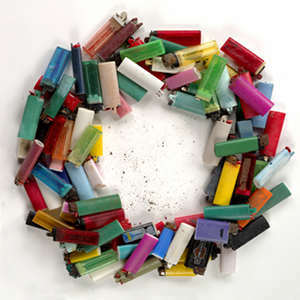 This wreath was made from "disposable lighters" that is good for any season but especially fine for the "season of light." All of these lighters washed up onto Kehoe Beach in the Point Reyes National Seashore where they have been collecting plastic since 1999. 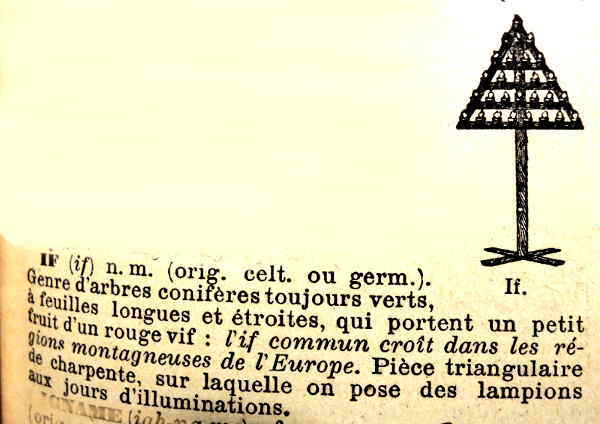 From an old french dictionary: "Yew (If) Kind of evergreen trees, with long, narrow leaves, which bear a bright red fruit: triangular piece of framework, on which are placed lanterns in the days of illuminations"
Artificial Christmas Trees - Artificial Christmas trees with pre-lit LEDs and fiber optic lights. 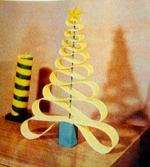 Artificial Christmas Trees - Christmas Trees - The Christmas Outlet Inc.
Christmas Gift Ideas - A unique collection of gifts for men, women and even babies. Elegant, personalized and memorable. Christmas Lights and More sells quality Christmas Lights including LED lights, mini lights, net lights, icicle lights, and rope lights to professional Christmas decorators, businesses, landscapers, and individuals year round at low discount prices. Christmas Ornaments Personalized - Find a variety of Christmas ornaments and holiday decorations for the seasons. Christmas Presents - Wide range of gifts and gadgets stocked for all ages. 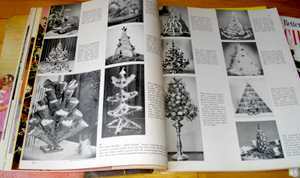 Christmas recipes - Christmas recipes and forum: puddings, desserts, cakes, starters, maincourse, turkey, sweets, chocolates and gifts, cocktails, juices. 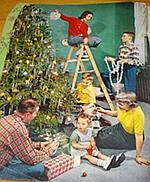 Christmas Trees and Ornaments - Interesting site discusses the different varieties of Christmas trees & which ornaments are best for each kind, where the trees are grown, and where easily available. Christmas Tree Locations - Learn about (live) Christmas trees, the different species, where they're grown, etc. 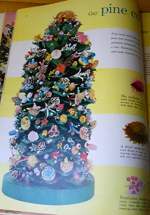 Christmas Tree Ornaments - Hundreds of unique Christmas ornaments in a variety of themes. Free shipping available. Commercial Christmas Ornaments - Large selection of commercial, shatterproof Christmas ornaments from finials to solid colored ball ornaments. The East Pole When was the last time you visited the East Pole? 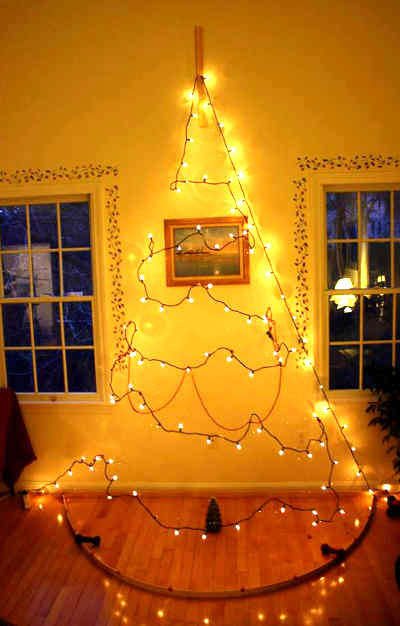 LED Christmas Lights - Choose from energy efficient LED Christmas lights in a variety of colors, shapes and sizes. 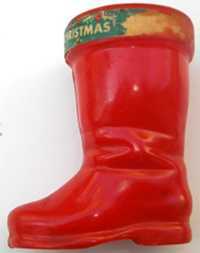 Personalized Ornaments - World's finest collection of personalized Christmas ornaments. Hundreds of ornaments to choose from personalized with your special message. 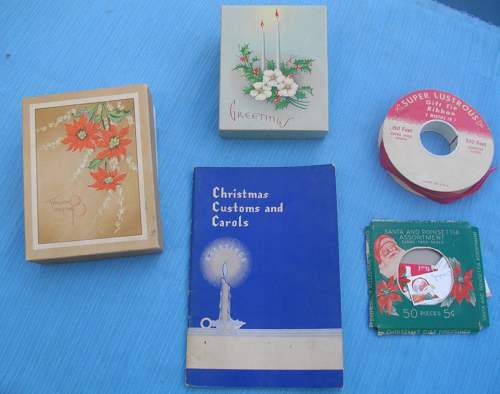 R and T Treasures - Our goal is to bring to you antique and vintage Christmas ornaments, specimen shells, collectible coins and other collectibles. 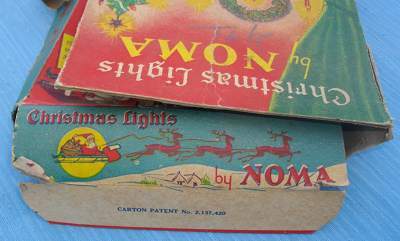 Santa Land: Christmas - Old fashion holiday traditions. 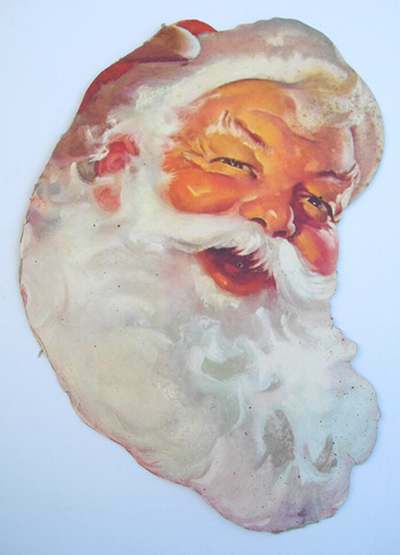 Send Santa a letter; read holiday stories; find Christmas carols, lyrics, and arts & crafts & more. Track Santa on Christmas Eve. Sports Christmas Ornaments - Over 1000 sports Christmas ornaments uniquely personalized to make a special gift. 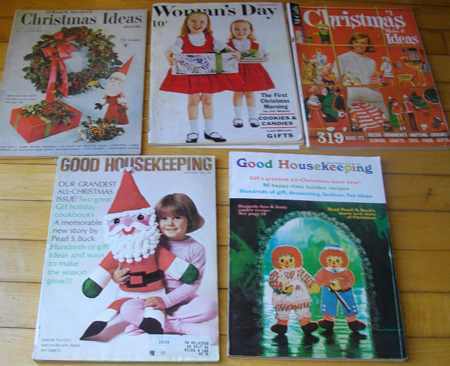 Includes hard-to-find sports ornaments like: curling, wind surfing, bungee jumping and more. 100 Free Greeting Cards - Free Greeting Cards,Valentines Day, Birthday eCards etc. 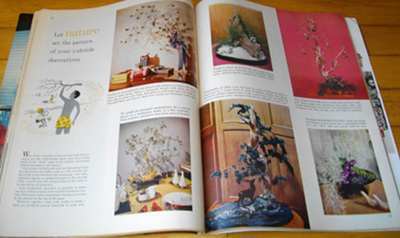 - collection of free greeting cards for every occasion. 101 Best Wishes - Best Wishes Greeting Cards, Christmas cards & Animated cards for all occasions. Choose from a wide selection. Birthday Cards Send your emotions with the help of these wonderful ecards from ATMGreetings & make your family/ friends/ loved ones/ colleagues/ feel all the more special. Charity Christmas Cards - Personalised Christmas Cards, Charity Christmas Cards - in the UK. Christmas Graphics - Large Collection of Christmas graphics! Creative Thank You Cards, Christmas, Wedding, and Moving Card - Offers unique collection of Christmas, birthday, wedding invitations and creative holiday cards. 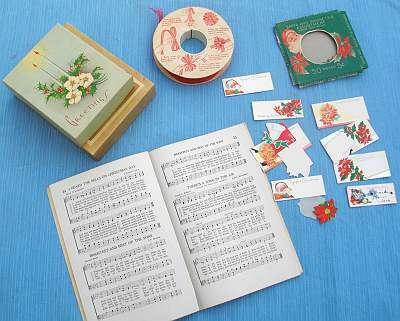 Free Christmas Card Day Cards - On this occasion pour your heart out and send lovely online greetings to your dear ones. Free Ecards - Send free online greeting cards, animated cards, ecards to your dear ones for all occasions. Happy New Year Ecards New Year is round the corner ! Time to celebrate a new beginning, a time to wish all your friends,family and loved ones a Happy New Year. Get ready to celebrate the coming year by sending free ecards & greeting cards. Dom itp - Handmade Glass Christmas Ornaments from Europe. 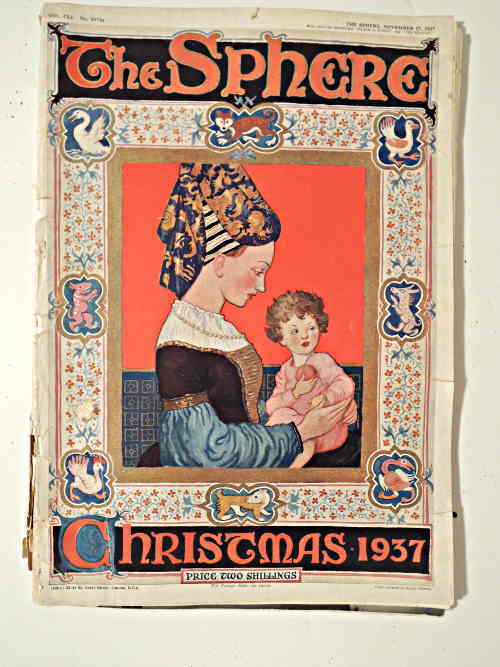 Old World Christmas Ornaments. We'd love to see and hear about your ideas, creations swap links ... Just email us. S&H included for US sales only. All others contact us first. 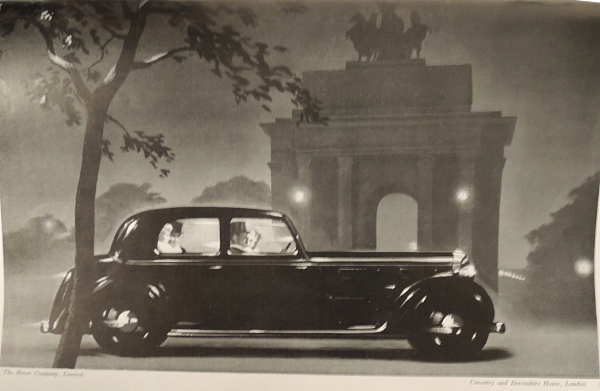 Size: 12" X 16 1/4"
If you're a fan of the period used for the Poirot TV series (David Suchet) - this shows the estates; the cars; the arts. Condition: Fair condition (well used copy) - fairly clean inside. 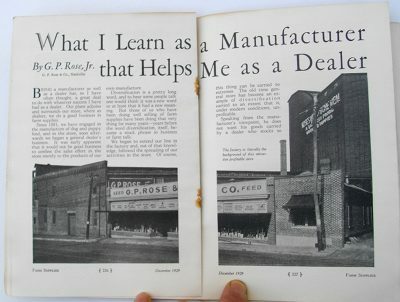 The edges of several pages are frayed. 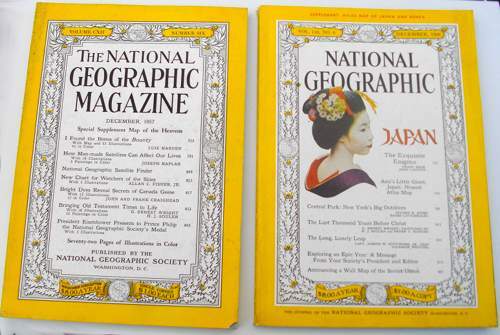 Size: 9 3/4" X 14 1/2"
Regularly numbered pages 531 to 566 + 179 roman-numeraled pages. 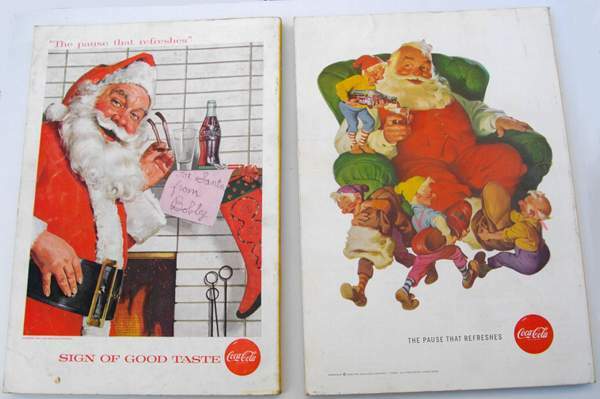 Filled with colorful artwork & full page cartoons, much suitable for framing. See photos. Condition: Fair - cover is beat up, has some tears etc. Issue is clean inside. a few pages are dog-eared. See Pictures. 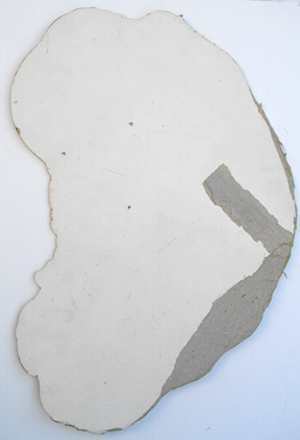 Size: 9 1/4" X 12 3/8"
Fair Condition.Complete, but cover is separated and has edge tears etc. 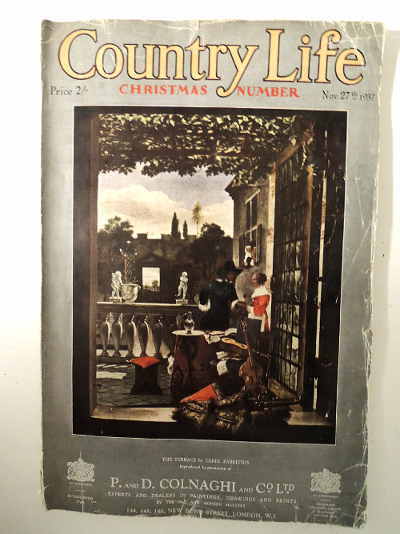 This magazine has seen much use, but it still is clean and readable and most pages inside are still suitable for framing. See pictures. Description: Many colorful suitable for framing images. 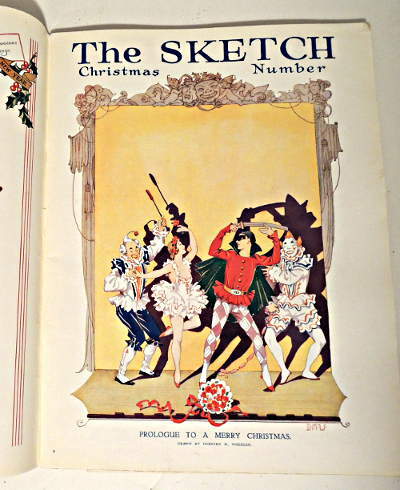 Subjects include: Stag hunt (wallpaper on 2 page spread); nuns and a miracle of the Virgin; Madonna, Christmas Eve; A stage-coach stuck in the snow; Playing Cards . . .
Centerfold features 2 page illustration by A.D. McCormick of Sir Francis Drake and Martin Frobisher deep in discussion. Fair Condition. Missing the presentation plate The Apple of His Majesty's Eye. The cover is separated and has edge tears etc. 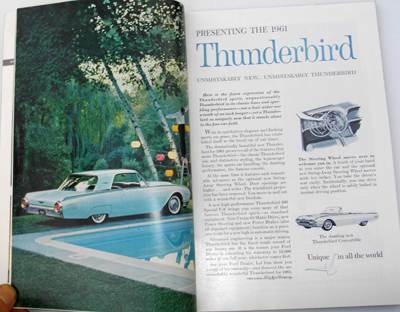 This magazine has seen much use, but it still is clean and readable and most pages inside are still suitable for framing. See pictures. 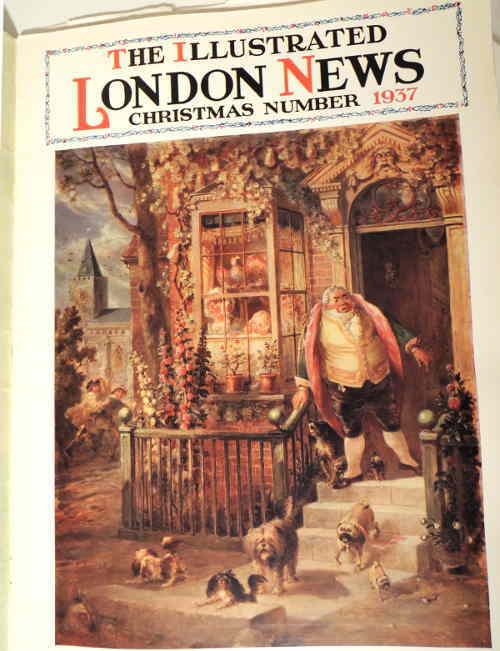 Size: 10 1/4" X 14 1/4"
Subjects: Snow covered country village; Letters of Long Ago; Shipwrecks; Flowers; Pirates (of course); Dickens' Great Expectations ( a topographical examination); Dutch Childhood; Canine Camera Studies (i.e. cute dogs); cats too . . .
Fair Condition.Complete. 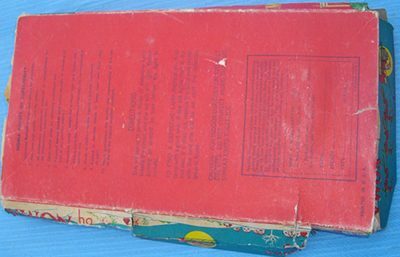 Cover is in poor condition is separated and has edge tears etc. 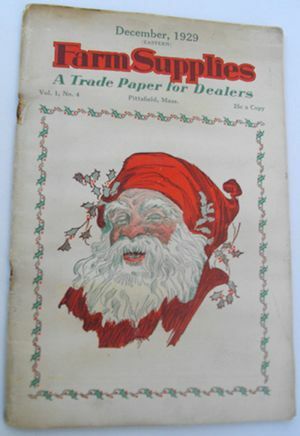 This magazine has seen much use, but it still is clean and readable and most pages inside are still suitable for framing. See pictures. Size: 10" X 14 1/4"
A delightful illustration of an elf perched on a Christmas Tree branch with his feet wrapped around a candle and admiring himself in the reflection of a tree ornament. 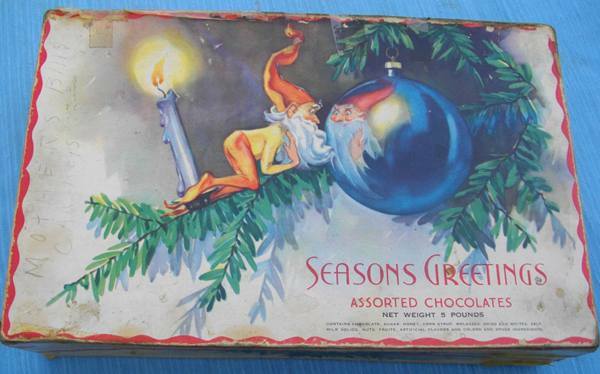 The box is marked "Season's Greetings Assorted Chocolates Net Weight 5 pounds (and then the candy ingredients)". 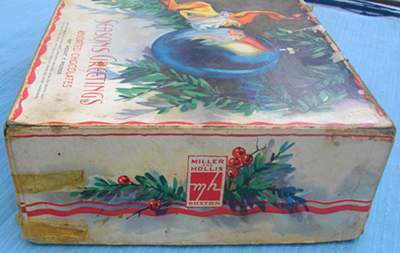 One long side of the box lists the various candies you would have found inside and on either end of the box it says "Miller and Hollis Boston". I couldn't find too much on the M&H company, but they were definitely active in the 30s and 40s until Deran Confectionery bought them for their Haviland Chocolate in 1961. Necco is the current owner. 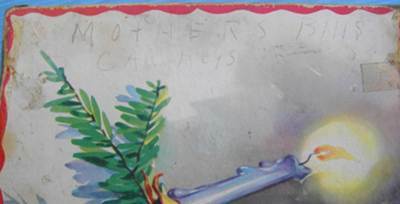 Penciled on one end of the top of the box it says, "Mothers Bills Car Keys". 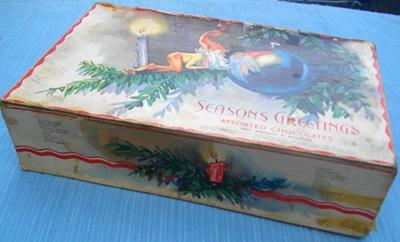 This secondary use is the reason this box survived after the chocolate was gone. There is old scotch tape on the edges in several places. 11 1/2" X 7 1/4" X 2 7/8"
Printed on paper and mounted on board. - Fair to good condition. There are 3 pin holes where someone mounted it through his eyes and mouth and various splatter marks and yet he still looks warm, cheerful and festive. 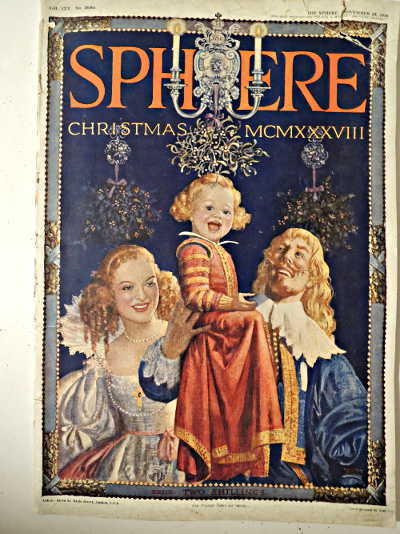 This was a promotional gift booklet: The inside front page is printed: "With wishes for a Merry Christmas and A Happy New Year New England Model Distributing 50 Cross St. Winchester, MASS." 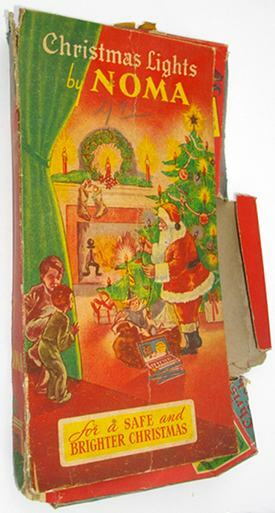 The cover is in fair condition with various stains. The inside is in very good condition. 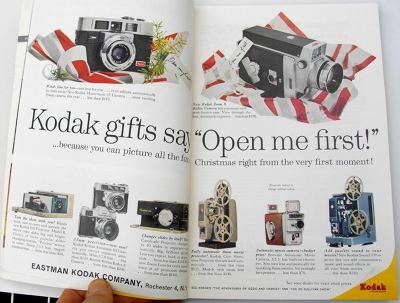 If you're having trouble finding a gift for someone, you can get them this booklet as a gift. 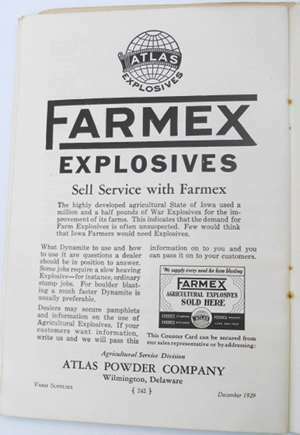 Then they can feel lucky you didn't buy them an ostrich plume hat or a meat grinder or garters or suspenders etc. as suggested within these humorous pages . 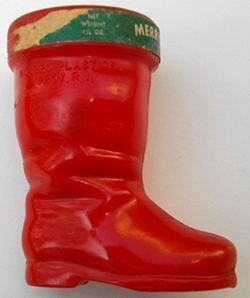 Red plastic boot with part of the original green label that says "Merry Christmas Net Wt. 1 1/4 oz." Marked on the plastic it says "Rosbro Plastics Prov. 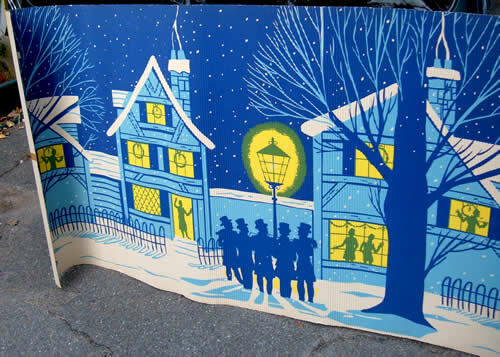 R.I."
This was a store display used in a drugstore in Haverhill, Massachusetts, ca.1940s or 1950s. 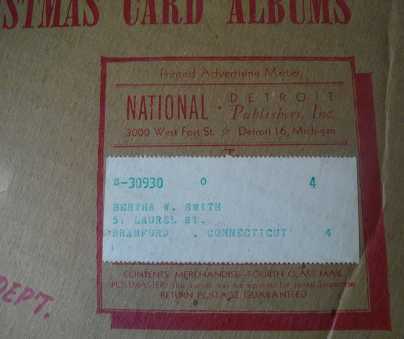 It is corrugated paper labeled on the back "A Sherman Sales - Winning Display Material".. It is 40 1/4" high and 9' 10" wide. The pattern repeats twice. 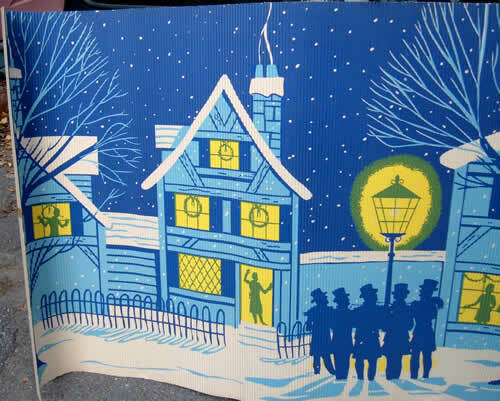 A cozy winter scene: X-mas carolers in the snow, under the street lamp in front of an iron fence. Smoke rises from the chimneys as fresh snow flutters to the ground.. 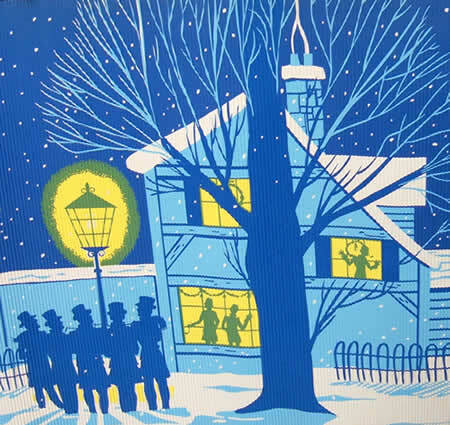 Listening from their houses are men with pipes and women waving ... wreaths in the windows .... The tree behind the street lamp creates a halo of light. The colors used are 2 shades of blue, green, yellow and white. (It's the rare christmas scene that has no red). 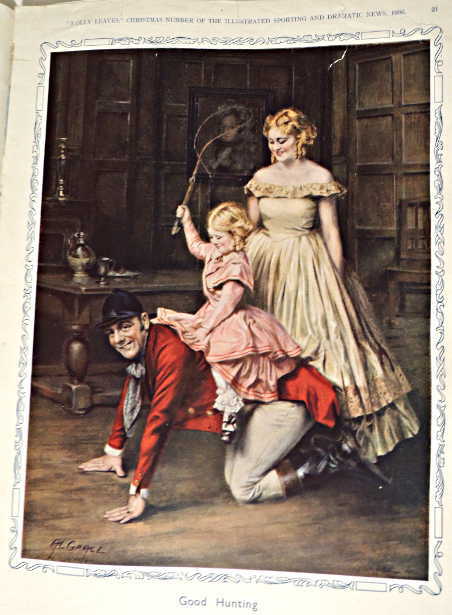 I think it would be rare to find many like this particular piece that had been saved. I'd consider this to be in good condition for an ephemeral item of that was used yearly. There is some compression on the edges where it rested on the ground. It's a pretty safe assumption that this is a rare item of ephemera. 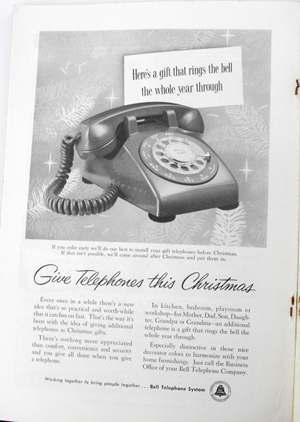 How many people would save a cardboard box from 1955? 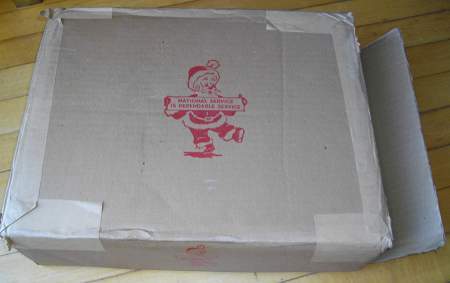 It has a few dings and dents, faded shipping label . 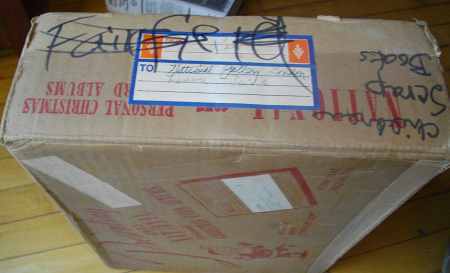 . . but in otherwise the same condition as when it was unpacked over 50 years ago. 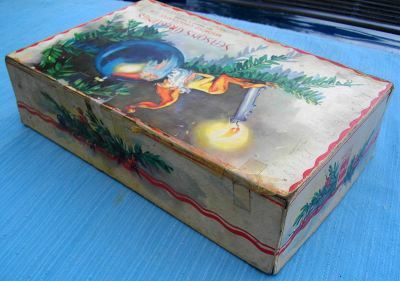 A great place to store your some of your vintage christmas items off-season as well as a conversation piece for your holiday display. 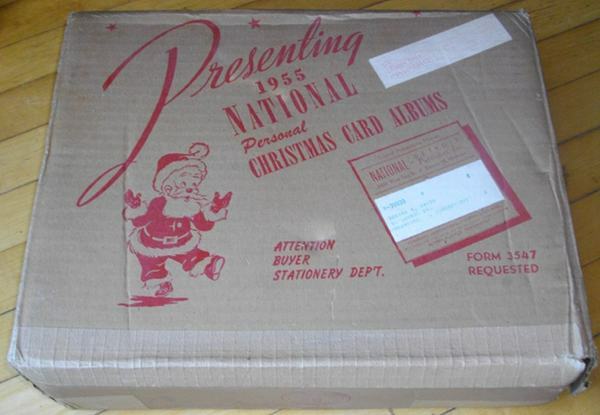 "Presenting 1955 National Personal Christmas Card Albums"
Santa's sign reads, "National Service is Dependable Service"
The box is made by Western Paper Box Company, Detroit, Michigan Dimensions: 15" X 12" X 4 1/4"
Creates a nice display of preparing for the Christmas season in the 1940s and 1950s. 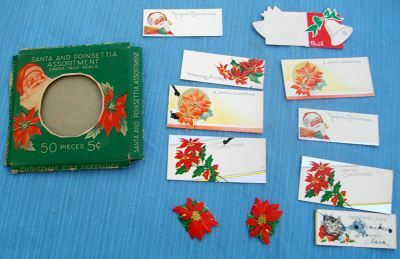 Package for Santa & Poinsettia Gift Cards and seals - including several of the original(?) cards and seals. One card was written, but not used "To Frankie from Clara" Several others have ink stains apparently from when Clara was filling these out. 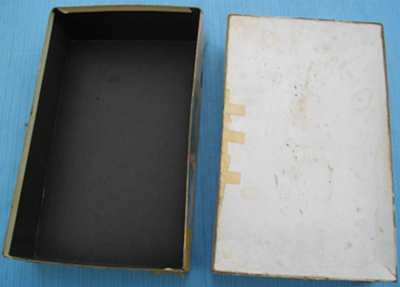 The box was originally 4" X 4", though now that it's been flattened, it's now a bit bigger. 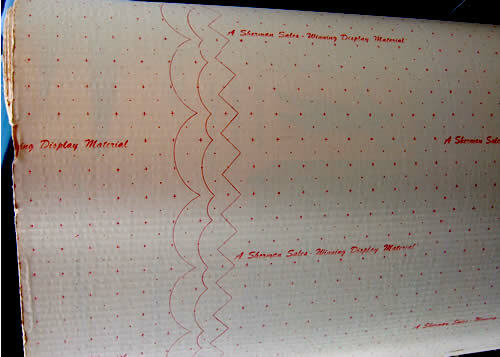 1 roll of red Super Lustrous Gift Tie ribbon about 2/3 full - 2 widths in 1 designed so it could be split down the middle. 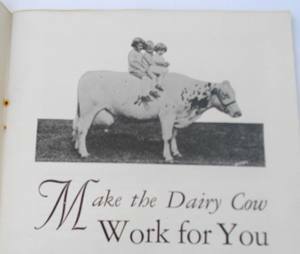 We're selling this for the cover, but the picture of the 3 farm children on the cow is priceless, and how about placing an order of explosives for your farm? Selling as found. 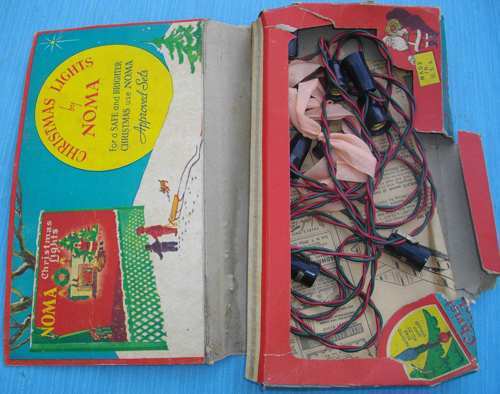 The box says: "For a Safe and Brighter Christmas"
"Patented beads holds lamp upright"